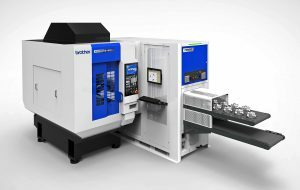 A robotic component handling system, Feedio, has been introduced by the Japanese manufacturer, Brother, to increase the production efficiency of its Speedio range of 3- to 5-axis machining centres. Available in the UK and Ireland through Whitehouse Machine Tools, the compact unit can be retrofitted to upgrade any machine in the range. All are highly productive, with tool change in under one second, 0.2 second spindle start / stop, 50 m/min rapids, 30 m/min cutting feed and 377 m/min synchronised tapping, for example, coupled with simultaneous movement of up to five CNC axes to minimise non-cutting time. The automated component load / unload option exploits that speed to the maximum by delivering parts to the spindle faster than an operator is able to and without interruption. The plug-and-play automation unit, which communicates with the machining centre via a Profibus interface, is supplied with a 6-axis ABB robot and the manufacturer’s smart teach pendant incorporating a customised Speedio page. Extended periods of unattended and overnight running are possible, enabling manufacturers to make the most of their investment in the machining centre in the knowledge that the automation has been designed specifically for it and is not a generic solution provided by a third party. 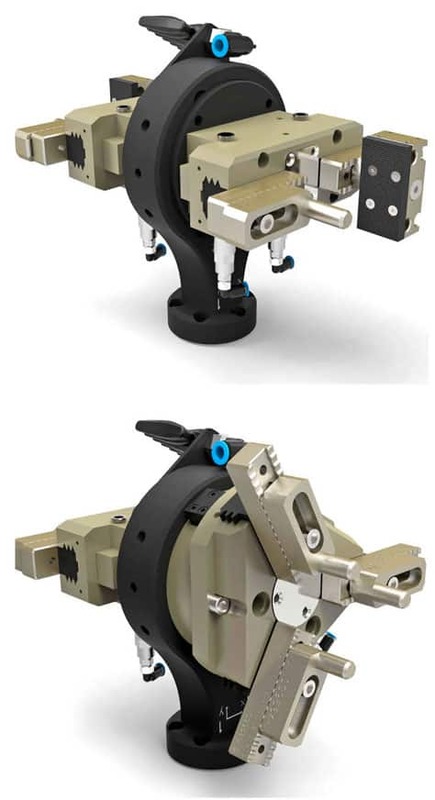 Having a handling capacity of 10 kg or 20 kg, the robot can be equipped with standard interchangeable grippers with two or three fingers or an adjustable double gripper, all with an air blow nozzle if required. A camera vision system and built-in PC allows the robot to detect where on the upper inlet conveyor a workpiece has been placed. After machining, components are returned to an output conveyor positioned below the first. Accessibility to the machine from the front is maintained by positioning the automation unit to the side, a configuration that allows it to serve two Speedios. Options include a static station for regripping a component, a turn-around station, and equipment for deburring, washing, air cleaning and part marking.